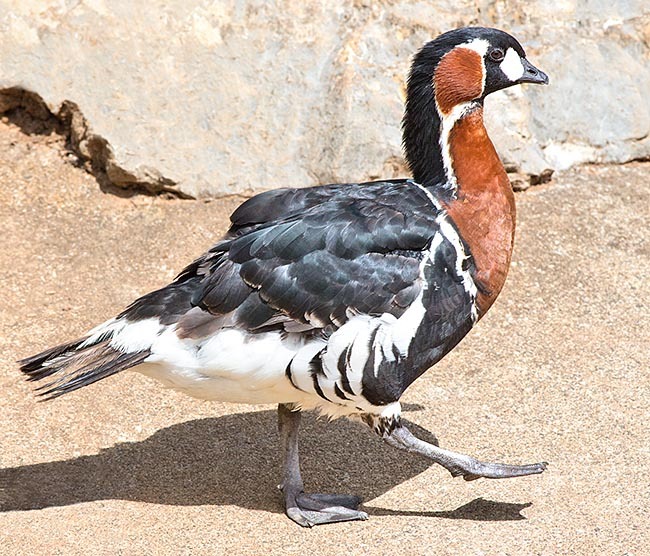 The Red-breasted goose (Branta ruficollis Pallas 1769) is a wonderful goose with a characteristic livery formed by the combination of three well marked colours (white, black and brick-red). It belongs to the order of the Anseriforms (Anseriformes), to the family of the Anatids (Anatidae), the genus Branta and to the species Branta ruficollis. The name of the genus “branta” probably comes from the Old Norse word “brandgàs” which means ‘burnt goose” with reference to the dominant colours of the geese belonging to this genus. 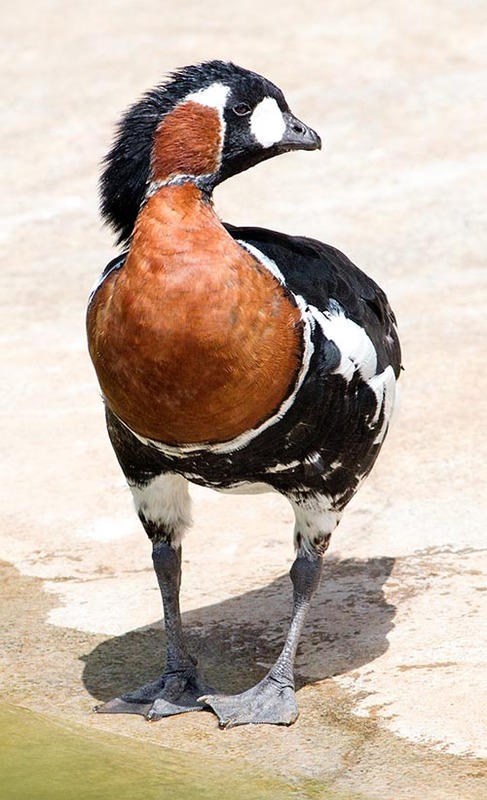 The ref-breasted goose has, in fact, a so particular livery that for some time they had thought to insert it in a genus in its own, but deeper studies have determined that this is a goose to be included in the genus branta in all respects. The name of the species “ruficollis” comes from the Latin “rufus” = reddish + “collum” = neck and refers to the peculiar brick-red colouration of the neck of this species. It is a monotypic species with arctic distribution, typical of western Siberia, migrating to south-west and wintering in the Balkan countries, west to Caspian Sea and north of the Persian Gulf. The expansion of the wintering quarters towards west (especially Romania) has determined and increase of the European reports, which have become annual in the Netherlands and in Great Britain. Even if for some reports there is certainty of the wild origin of the animals (confirmed by catches of ringed birds), for others it cannot be excluded that it is matter of specimens escaped from the captivity, being the species very much appreciated and fairly raised for ornamental purposes. It has an irregular and occasional appearance in most of northern and central Europe and even rarer in the southern one and in the Mediterranean Basin (Spain, Italy, Yugoslavia, Israel, Cyprus, Turkey, Egypt). In Switzerland, it is considered as an adventitious species of uncertain wild origin. The past reports happened in Italy had all happened during the winter season. During the last years this species has registered a recent increase of presence in various European zones. This phenomenon of expanded wintering has interested, at the same time, other species of western geese such as the Canada goose (Branta canadensis) and the barnacle goose (Branta leucopsis). On the basis of these recent reports it is thought that the red-breasted goose, in these nations, can be considered more than an accidental species, as a rare and relatively regular migratory and wintering species. Until a few decades ago, the species was considered more uncommon than it actually was. The fact that there is an estimated population of about 40.000 wintering specimens, however, does not mean that the species is not to be protected and safeguarded as is the case. This especially because the species lives in a not very ample home range and that it needs safe locations for the nesting as well as for the wintering; unluckily, the human interactions and the climate changes are creating many problems also to this species. During the reproductive season it lives on the stony or sandy river banks. In the wintering quarters, it loves the grassy prairies, steppes, banks of sand on the seashore. It nests in the Euro-Asian tundra in a relatively restricted area from the 80th to the 140th meridian north to the Arctic Circle. It is the smallest goose, with typical anserine forms (stocky with relatively elongated neck and legs in mid-body): total length 53-56 cm, wingspan 116-135 cm; male’s wing 344-362 mm; female’s 342-358 mm and weight of about 1050-1700 g with the females lighter than the males. It is characterized by a contrasting white-black livery with a distinctive red-brown zone on the auricular zones and on the fore part of the neck and of the upper chest, edged of white. The sexes and the seasonal liveries are similar. In detail, the livery presents upper parts, wings and tail included, black with greenish reflections on the back, rump and coverts. The big and medium alar coverts have white apices forming two white bars across the wings. There is a large roundish white spot between beak and eye (which has dark brown iris), the face is black, the auriculars and the sides of the head are lively reddish-brown limited by a white line descending along the sides of the neck (which as an apparently big and stocky shape). The chin and the throat are black. The black of the throat unites, through the face, to the black of the vertex forming a vertical line, always black, which crosses the eye, some white on the chin. The rest of the neck and chest are light brown-reddish separated from the black of the lower parts by a white line strictly and superiorly bordered of black on the chest. The sides of the abdomen and the sides are widely white, some feather has black apex. Low chest and belly are black. Lower abdomen, abdomen and lower coverts of the tail are white, white thighs, axillar feathers are dark sepia, and lower coverts of the wing are black. The third primary remex is longer than the others; the second is emarginated on the inner barb, the third on both, the fourth on the exterior. The lower coverts of the tail reach the apex of the same. The tail is almost squared and is formed by 12 rectrices. The beak is small (22-27 mm long), shorter than the head, taller than wide at the base and of black colour. There are 16 denticles, not visible when the beak is closed; the nail is round. The paws (the tarsi are about 52-60 mm long) are black/grey-dark lead. The species even if deliciously multicoloured it is rather dark when flying and therefore it is little identifiable. The juveniles have more opaque and brownish general hues with auricular spot less expanded-absent with brownish-cinnamon-greyish colouration; they have more numerous bars on the sides and on the wings but less distinct and less regular, the apex of the tail s usually white. The black-brownish parts are spotted of white on the chest and the wings, the red parts are paler. Goose with marked distinctive characters and with rapid movements, moves rapidly the head and has behaviours similar to those of the Wild goose (Anser anser). It flies in irregular formations. At sea, it goes on the sandy banks for spending the night. It is a shy but sociable goose, has gregarious behaviours also with similar species and in particular with the Brant goose (Branta bernicla) and the Greater white-fronted goose (Anser albifrons). Also when pasturing, the red-breasted goose is fairly mimetic and mixes, seen from far away, with the other species of geese it frequents. In these instances, in the mixed groups, it is better identifiable due to the reduced size than for the colouration which, also in this case from far away, results as dark. It nourishes of grasses, preferring buds, and of seeds. It emits high and musical vocalizations, even if a little harsh. The contact call is a dissyllabic “chi-chua, chich-uich, ti-ci”. It nests in single pars (monogamous species) or in small colonies. The nests are placed on sandy and rocky banks along the rivers often close to some low bush and on the few ridges and elevations, available, of the ground. Sometimes, it uses a very peculiar system for protecting itself and its own eggs: to nidify close to the nest of a hawk. Often, but not always, the hawk in question is a Peregrine falcon (Falco peregrinus). Nesting close to the nest of this, the goose places its own nest inside the territory defended by the raptor. As a matter of fact, in the Siberian tundra, also the hawks are obliged to nest on the ground. In these cases, the hawks close to the nest, do not consider as potential preys the harmless animals present inside their own nesting area and, defending their own territory, protect and defend indirectly also those being inside it. The red-breasted geese adopting this strategy try to contrast basically, the predatory action of their main foe: the arctic fox (Alopex lagopus). In exchange of the protection given to the geese and to their hatching, also the hawk will receive an advantage as it will be informed by the diligent and noisy vocalizations emitted by the geese in case a predator is approaching. This will allow the hawk will be ready in implementing the defence action for protecting its own, and the other’s hatching (mutual benefit relationship). The nest is located in a small depression of the ground and is covered by grasses and down. 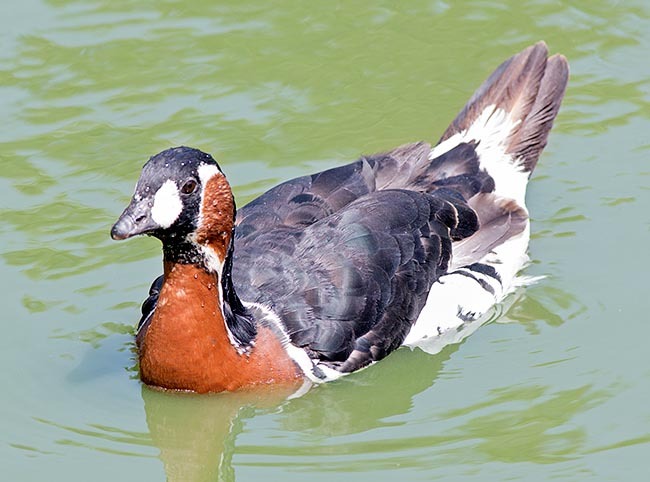 The red-breasted goose lays, mainly, during the second half of June, generally 4 to 5 (9) eggs of cream-white or white-greenish colour. The egg has an average size of 71 per 48 mm (60-72 x 43-49 mm) and average weight of the shell of 6 g. The eggs are incubated by the female only for about 25 days; the male has the duty of the watching and of the defence. The chick, upon the birth, has the upper parts brown-dark greyish coloured. Parts between eye and lateral portion of the beak base, vertex of the head and ring around the eyes are blackish. The chinstrap and the lower parts are yellowish. Beak, paws and feet are black. The iris is dark brown. The chicks of the red-breasted goose, like those of the other species of Nordic geese, grow rapidly in order to quickly acquire the capacity of flying and the necessary strength for dealing with the winter migration. This species is not affected by the disturbance done by the man, the sea pollution and by the utilization of the soil close to the few areas of winter foraging.